Are Short Video Clips Making a Comeback Through TikTok? Have you heard of TikTok, the music video focused app which enables users to post short clips - mostly lip-synching or dancing - and share them with friends? If you haven't heard of TikTok, you've likely heard of musical.ly, which, since August, has been re-branded as TikTok after being acquired by the app's parent company, ByteDance, back in November 2017. 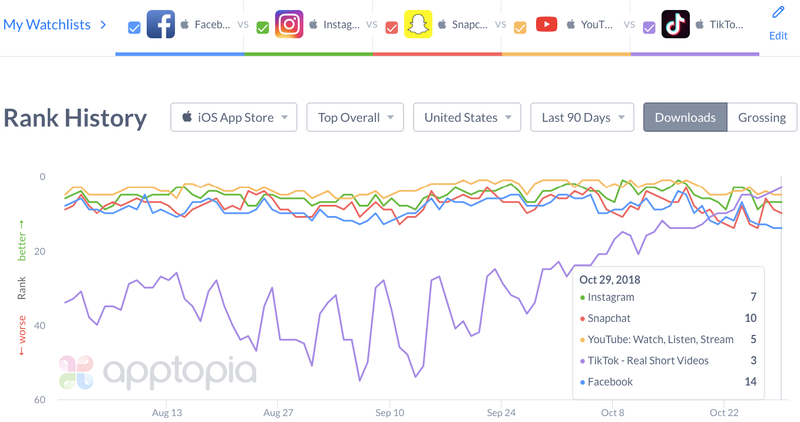 Whether it's on your radar or not, it is worth paying attention to - according to new research from apptopia, TikTok is growing fast, with worldwide downloads up 20% in the last three months, and U.S. downloads up 25%. In fact, TikTok is currently seeing more downloads than Snapchat, Instagram, Facebook and YouTube. That seems worthy of note, right? So what's the deal with TikTok? Essentially, TikTok fills the gap left by the demise of both Vine and musical.ly, providing a way for users to share fun, short video clips (clips are limited to 15 seconds, but can be strung together into longer-form stories). Currently, TikTok has 130 million users - and as noted, is growing fast - so while it may not have an audience comparable to most of the big social channels, it is getting more popular. The app's popularity has been boosted by the introduction of its 'Reactions' feature a few months back, which enables users to post their own video responses which play alongside the original clip. You can see how it's gaining momentum - the clips are quick, funny and enable creativity. Just like Vine, which was hugely influential before it withered away. Where TikTok may have a particularly significant advantage, however, is its testing ground. As noted, TikTok is owned by Chinese company ByteDance, which operates another, very similar app in China called Douyin. Douyin has more than 300 million monthly active users - which, essentially, means TikTok has more like 450 million users worldwide. But that also means that TikTok has a whole other, larger app through which it can test out different tools and options before rolling them out in western markets. So is there brand opportunities on TikTok? Sort of. NBCUniversal and Seventeen are already hosting short “shows” within TikTok to appeal to younger users, which suggests that there will be expanded opportunities for content - and likely ads - in future. Depending on whether it can maintain its current momentum, that could make it a significant digital marketing consideration in future. It's early days yet, and it's not a format that's particularly conducive to ad content. But if you want to reach younger users, it does seem to be where more of them are looking right now. The data suggests that TikTok could become the next Snapchat - but it could also become the next Vine. In order to grow, the company will need to diversify its offering and provide marketing tools - while it may also have to deal with Chinese ownership concerns in the US, particularly in relation to data storage and use. But the latest trend data is worthy of note. Again, it's early days, but TikTok looks like an app to watch in 2019.